CarGurus has 22,425 nationwide E-Class listings starting at $1,500. Refined and powerful engines, comfortable and competent suspensions and leading build quality make the 2011 Mercedes-Benz E-Class a solid choice for an executive vehicle. A deceivingly low entry price that jumps quickly as options are clicked and the lack of more transmission options are small negatives for the 2011 E-Class. 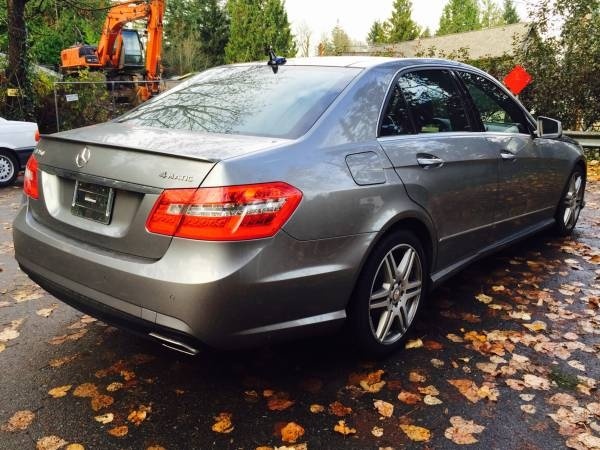 The 2011 Mercedes-Benz E-Class has something for everyone – who is willing to pay for it. The sedan is an incredibly versatile vehicle, able to do family duty, touring duty and sport duty with equal panache, and for those who want something a little more focused, the coupe, convertible, AMG and turbodiesel options leave little to want. Watch for the price jumps as the options add up, but otherwise you’ll find little to complain about with the E-Class. “Sharp all around” could describe the E-Class. Last year, Mercedes introduced the vehicle’s ninth-generation platform and seemingly yanked all the organic aesthetic out of its stout executive. Walking around the E-Class, sitting inside, every line seems to be sharp and straight. A closer look reveals the truth, because the E-Class is a study in juxtaposition. For every straight line, there’s a bulge or a curve waiting. Sports-car performance tempered with ultra luxury. The E-Class is a compromise without compromise, something German car companies seem to do so well – purposeful design that doesn’t feel Spartan. The fact it’s available in so many configurations only proves the point. You choose – sedan, coupe, estate, convertible or diesel – the E-Class can offer it all. The year after a new generational introduction is usually pretty quiet, but the diesel sedan, convertible and estate wagon are all new for 2011, and that’s razor sharp. The E-Class is powered by one of no less than four engines, depending on the trim chosen, including a diesel option. Starting with the E350, buyers will be treated to a 3.5-liter V6 engine, tossing out 268 hp and 258 lb-ft of torque. Peak power for this engine comes at 6,000 rpm for hp and 2,400 for torque, providing a wide and versatile powerband that reacts well to aggressive throttle or subtle changes. The baby of the bunch, it’s still quick enough to propel an E350 sedan to 60 mph in 6.5 seconds, and .3 seconds quicker in the coupe. E550 trims get two extra cylinders and a lot more hp in the form of a 5.5-liter V8 engine producing 382 hp and 391 lb-ft of torque at 6,000 and 2,800 rpm, respectively. It’ll make the 60 trip in 5 flat according to Mercedes, but some testers have mentioned feeling slower. This can be explained by the overall girth of the E550, with a curb weight that peaks near 4,000 pounds. Regardless the 5.5 is noticeably faster than the 3.5 and stronger still in all situations, providing smooth application of power that would require throttle stabs and downshifting in the E350. For a more unique power delivery system, look to the 3.0-liter turbodiesel V6 in the E350 BlueTEC sedan. With a comparatively puny 210-hp rating, the real power comes from the 400 lb-ft of torque it’ll produce. There’s also the peak power levels arriving at 3,800 rpm for hp and a knee-creaking 1,800 rpm for the torque figure. That means a stupid amount of power almost immediately available from a refined turbodiesel engine that will do little to remind you of the diesel offerings of the previous generation. But that’s not the end of the story. Mercedes handed over engine responsibility to AMG to produce its first engine from scratch for the company – a monster 6.2-liter V8. 518 hp shows up at 6,800 rpm, just a short time after peak torque arrives, bringing in 465 lb-ft at 5,200. For anyone courageous enough to exploit maximum power, this means a 4.4-second trip to 60 mph. It was designed primarily as a racing engine, but also for use in special versions of Mercedes automobiles. Upon its introduction, Mercedes claimed it was the world’s fastest naturally aspirated V8 engine. It feels it. A 7-speed automatic transmission is the sole offering for all available engines and configurations. It’s smooth and quick, although some testers have found it hunting around with the 3.5-liter engine, especially when sticking around second and third gears. Still, it’s enough to deliver 18/26 mpg in a rear-wheel-drive E350 or 16/24 if equipped with all-wheel drive – the same as a RWD E550. Clicking AWD for the E550 will drop fuel economy down to 15/23. As expected, the AMG is the thirstiest of the group, clocking in at 13/20. However, it’s the diesel in the E350 BlueTEC sedan that really disappoints, managing to return only 22/33. Adjustments to the suspension and more importantly the steering have made this latest-generation E-Class a better example of German handling. 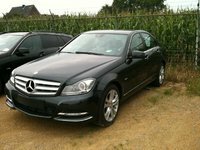 The best example would be an E550 sedan with its electronic air suspension, providing real-time inputs and changes to the suspension based on speed and driver input. It absorbs nearly all bumps, lumps and bruises without making the driver aware, but can still rise to the level of performance needed when you start pushing. Lighter E350 trims are more nimble, but don’t handle bump absorption with as much ease. Thankfully, even the stiffer suspensions available in the Sport and AMG Performance packages manage to blend handling and ride quality with impressive grace, never letting you down in a corner while also not registering every little ripple. Combined with the steering improvements it’s been a big upgrade in the handling department for Mercedes, pushing it much closer to class leader BMW. The E-Class benefits much from the hand-me-downs of its bigger brother the S-Class, benefiting from much of the tech and luxury that have debuted there. While some still complain about the complexity of the COMAND system, which manages both audio and navigation functions, the system is well-designed and easy to operate while driving, after the initial configuration. Cars simply aren’t the “open the door, sit in the seat, turn the key and go” affair they used to be, and this is a good thing. There’s a lot variety in the E-Class’ interior design, depending on trim chosen, although it’s all aesthetic. Build quality and materials remain consistent however, and are both at the top of the class. Metal and wood accents are especially helpful in raising the overall ambiance, as is the ambient LED lighting in the sedan. Seating is spacious and comfortable in the sedan, but becomes increasingly limited in the coupe and convertibles. 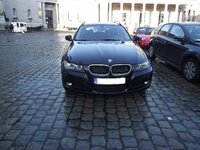 Whereas space is abundant front and back in the sedan with regard to both head- and legroom, headroom becomes sparse up front in the coupe or convertible, and both are at a premium in the rear. The headroom issue at least can be combated by lowering the power soft top, which drops in less than 20 seconds at speeds up to 25 mph. Safety has always been a top priority for Mercedes, and it shows in its list of standard safety features. All E-Class trims come standard with traction and stability control as well as four-wheel antilock discs with brake assist. The usual dual front and front-side airbags are included here, but you’ll also get front hip-protecting airbags as well as a driver knee airbag and four curtain-side airbags in the sedans and coupes. Convertibles instead get front curtain-sides alone. Further safety features include Driver Fatigue Alert and a Pre-Crash Safety System, along with daytime running lights. While the design of the E-Class has been slightly divisive, overall build and material quality have created no such problems. The E-Class remains a leader in both categories here and similarly comfort also remains a strong point. In fact, with the changes that have been made to the suspension and steering, overall ride comfort has increased in recent years, not to mention handling in general, attracting new owners to the brand. While some complain about the comfort and space of the coupes and convertibles, it’s hard to take such criticism seriously when the sedan option is readily available. What's your take on the 2011 Mercedes-Benz E-Class? Users ranked 2011 Mercedes-Benz E-Class against other cars which they drove/owned. Each ranking was based on 9 categories. Here is the summary of top rankings. Have you driven a 2011 Mercedes-Benz E-Class? need to stop ad. never got inquiries.